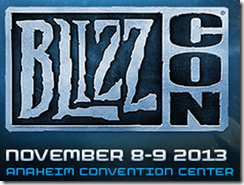 Blizzcon 2013 is almost here and it’s time for our Pre-Blizzcon show! We are joined this week by a couple of Blizzcon Noobs. Jed from Jed’s Corner of WoW Shenanigans and the Follow the leader podcast and Rilandune from Heroically Random and, of course, the Random Rants and Ravings with Rilandune segment. Pack long pants, not just shorts and Light jacket. Can get cold at night in Nov.
Room for Goodie Bag on way home and other stuff you buy. Next show is Episode 212, we will be having it after Blizzcon has come and gone. Send us questions early and don’t forget to join us to ask questions live.